Weekday Classes: Fire & Life Safety Director (FLSD), Fire & Non-Fire with Active Shooter – NY Fire Consultants Inc. This is the New York City Fire Department (FDNY) accredited course for Fire & Life Safety Directors (FLSD). The course provides the required 31-hours of instructions over 6 days. SIGN UP FOR THE COMPLETE COURSE HERE AND SAVE !! This Fire & Life Safety Directors (FLSD) course is required for all hotels and office buildings. Original 7-hour Non-Fire Emergencies EAP course is only offered to candidates who possess a valid F-85 C of F and haven’t failed the FDNY non-fire FLSD CBT exam twice. Pre-requisite for FLSD F-89: 1.5 years of Fire Safety related experience, including 6 months of experience in one property. FDNY requires that you attend all classes and receive a mark of 70% on NYFSI’s final exam for this course. Those passing with a mark of 70% or higher are granted a diploma from NYFSI, which must be presented at the Fire Department. A Fire Life Safety Director (FLSD) is required in any commercial building or occupancy that obtained FDNY approval of the installation of a fire alarm system with two-way voice communication, and is required to provide a FLSD or other specified emergency preparedness staffing during regular business hours required by Chapter 4 of the Fire Code. Any building classified as Group E (1968 Code) or Group B (2008 Code) by the NYC Department of Buildings, which has an occupancy of 100 people or more must have a Fire & Life Safety Director on site during regular business hours. This includes office buildings, public or civil services buildings, and hotels. The Fire & Life Safety Director must hold a valid Certificate of Fitness and is responsible for implementing a fire safety and evacuation plan, training fire safety personnel (FSP), and other duties related to fire safety and evacuation plans. This Certificate of Fitness is valid only at a specific location and for the specific person to whom it is issued. Download the FDNY Notice of Examination, which includes the procedures and requirements to become a certified Fire & Life Safety Director. Apply with the FDNY for your Certificate of Fitness for Fire & Life Safety Director. You will also find links for the FDNY’s onsite exam study guides. Download the FDNY Verification Letter for Application for Fire & Life Safety Director T-89. Download the FDNY Application for Z-59/N-89/T-89 Fire & Life Safety Director Hi-rise & Hotel/Motel. Use this link to schedule the Fire & Life Safety Director Onsite Exam with the FDNY. 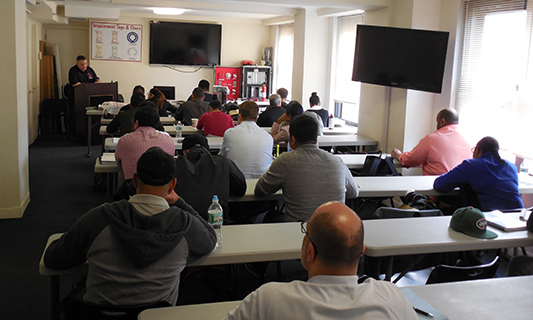 All classes are taught at NY Fire Safety Institute, located in The New Yorker, A Wyndham Hotel, Suite 618 (8th Avenue at West 34th Street). See below for directions. If you would like NY Fire Consultants to provide your team with a private class, onsite training, or instruction in order to obtain an FDNY Certificate of Fitness in other areas beyond the current NYFSI curricula, please contact our office. © Copyright 2007 – 2016 NY Fire Consultants Inc., NY Fire Safety Institute. All Rights Reserved.